President Maithripala Sirisena speaks at the SLFP Nivitigala Bala Mandala meeting in Nivitigala. President Maithripala Sirisena said that he is scheduled to address the UN General Assembly on September 24 and he would make a statement to vindicate the Security Forces from all allegations levelled against them. 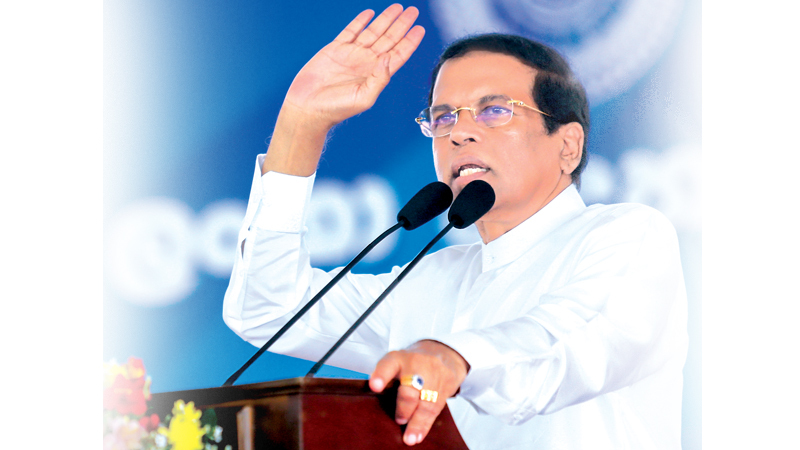 President Sirisena was speaking at the SLFP Nivitigala Bala Mandala meeting held at the Nivitigala public fair premises, on Saturday. “No matter what allegations are levelled against me by political opponents, I will continue to fulfill my duties toward the country, much more than anyone has done in the past,” President Sirisena said. He also said that he has created an environment where the common man could reach the highest level, while strengthening democracy and vesting the superior powers of the Executive Presidency in the Parliament, which no other leader in the world has done. President Sirisena said that the true Bandaranaike policy and the policy of the SLFP is to always put the needs of the country first. Although the main allegation against the SLFP is that it is joined with the UNP, it did so to fulfill some tasks which could not be fulfilled by the previous government and today, the government was able to win the support of the international community whose cooperation is now being used for the benefit of the country, he said. Expressing his views regarding the development activities of the Ratnapura district, the President said that he will instruct the relevant authorities and the police to allow the people to engage in gem mining using kooda (cane baskets) in rivers and canals in the area, from this week. The President, felicitating 10 senior SLFP members of the Ratnapura district, presented awards to them for their long contribution to the development of the SLFP. The President also opened the Nivitigala SLFP office.